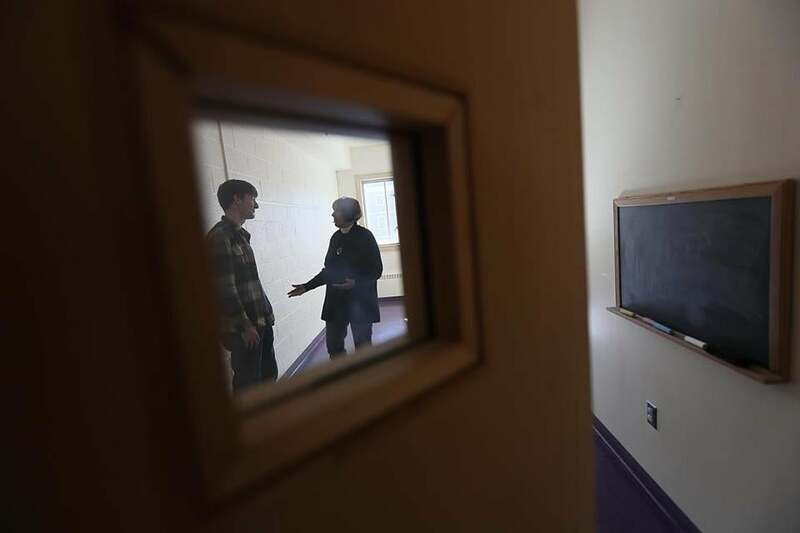 Harvard Divinity School intern Kristofer Rhude, left, and Pastor Kathleen Reed of the University Lutheran Church in Harvard Square inside one of the sanctuary space rooms reserved for undocumented people. Congregations in Massachusetts are joining dozens of US churches and synagogues that are helping to shelter illegal immigrants as the Trump administration intensifies deportation efforts. At least three Boston-area congregations have committed to offering living space in their buildings to illegal immigrants. A half-dozen more statewide are in serious internal discussions about doing so. And dozens of synagogues and churches have agreed to offer logistical and political support. Some Muslim and secular activists are helping as well. The congregations are seeking to highlight immigration policies they view as unjust and cruel, and one church, the First Unitarian Society in Denver, drew national attention last week after taking in a mother of three fleeing deportation. The effort is meant to be symbolic as much as it is to offer practical help to a share of the estimated 210,000 illegal immigrants in Massachusetts. Houses of worship offer no legal protection for the undocumented. But immigration officials have generally followed a “sensitive locations” policy and not normally taken people into custody in houses of worship, schools, or hospitals. A representative from US Immigration and Customs Enforcement was not available for comment Friday. “Immigration and Customs Enforcement is unlikely to break down the doors of the church to pick up somebody,” said the Rev. Abraham Waya of Brockton Central United Methodist Church, which he said plans to open space for a number of families with the aid of a network of partners. The movement is in some ways a resurgence of a groundswell in the 1980s in which hundreds of churches and synagogues took in people fleeing wars in Central America. Religious networks helped these immigrants travel to safe houses and congregations throughout the United States and Canada. Using their platform in the community, they held press conferences and teach-ins to educate the public about American involvement in those wars and to pressure the government to grant the immigrants legal asylum here. It often worked. The idea behind the sanctuary movement is not to secretly harbor illegal immigrants, but rather to take a public stand and showcase the stories of people at risk of deportation. Congregations that house immigrants plan to trumpet what they are doing in the media so that the stories of individuals affected by the policy can be brought to light. The Massachusetts Community Action Network says it is up to each congregation to decide whether to physically block an arresting officer who arrives with a warrant. But the network advises sanctuary congregations to instead watch what is happening, capture the arrest on video, and support the person being deported in many other ways — contacting family members and lawyers, picking up children at day care. At best, organizers say, sanctuary can buy time for a case to be adjudicated or generate public support that results in a favorable decision. At the least, they say, it can provide someone the chance to make family and business arrangements before deportation and contribute to awareness of the issue. Harboring illegal immigrants is a crime. Carreiro said that publicly announcing their efforts could help activists protect against legal repercussions, but not necessarily. In the 1980s, a few activists were prosecuted for helping provide sanctuary for immigrants. “We are going into this telling people very clearly that this is an act of civil disobedience,” said Carreiro. The University Lutheran Association in Harvard Square is offering sanctuary space for undocumented immigrants. For some congregations, the issue hits close to home. The Trump administration has said it is prioritizing the deportations of people who have committed crimes — and that includes, apparently, offenses such as using a made-up Social Security number in order to work, as was the case for the Colorado mother, her lawyer told news media. The Rev. 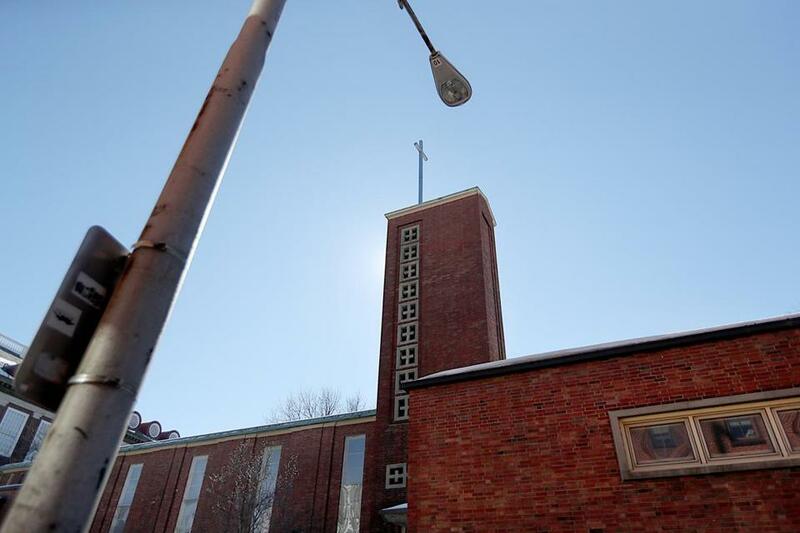 Edwin D. Johnson, pastor of St. Mary’s Episcopal Church in Dorchester, another church that is preparing to house people fleeing deportation, said the national conversation casting illegal immigrants as criminals has had a painful effect on many in his diverse congregation. “We have people in our community with various immigration statuses who have been told to ‘Go home’ even though they are naturalized citizens, or even though they were born here, just because of the way they look,” he said. In Cambridge, the University Lutheran Association of Greater Boston — a church near Harvard Square better known as UniLu and predominantly serving the academic community nearby — committed last month to becoming a sanctuary congregation. Three nearby churches, a student-led interfaith and secular organization from Harvard Divinity School, and the Cambridge Minyan, a Jewish community, have committed to assist as partners. Kristofer Rhude, the Harvard Divinity School intern at UniLu, said the congregation has been getting three to four calls a week from other churches inquiring about helping. UniLu has been working with its partners to prepare a trio of sunny Sunday school classrooms as sleeping and living spaces. They are collecting household items without being entirely sure what they will need, with the understanding that they’ll have to make adjustments depending on who arrives, said the Rev. Kathleen O’Keefe Reed, the pastor. “It’s a little bit like getting ready to have a baby,” she said.